By absorbing any acidity in the stomach, porridge should be your first port of call. It’s also healthy and filling. Start your day right! It may not be your favourite ingredient in the cupboard, but ginger is a great natural healer. Considered one of the greatest foods for acid reflux, its anti-inflammatory properties have been used to treat gastrointestinal conditions for some time. Ginger can be eaten raw, added to dinner time dishes or put into your daily smoothie. It may not be the most exciting dish on the menu, but your stomach will be more than grateful. Eating raw vegetables will help ease the symptoms of acid reflux, but leave out tomatoes and salad dressing to avoid irritation. Bananas can be a great healer for some and not for others, so it’s a process of trial and error. With a pH of 5.6, they can be very helpful to some acid reflux sufferers. On the other hand, some say that their acid reflux can be worsened by eating bananas, so monitor your symptoms. The good news is that you won’t have to avoid eating turkey this Christmas. 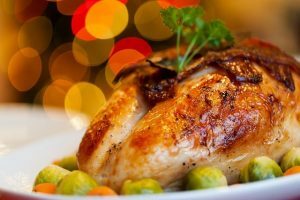 Chicken and Turkey are the best meats to eat if you’re experiencing acid reflux. Make sure you remove any fat and boil, bake or grill the meat.